Mumbai : The Bollywood's megastar Amitabh Bachchan, who making millionaires to many people in 'Kaun Banega Crorepati' (KBC). 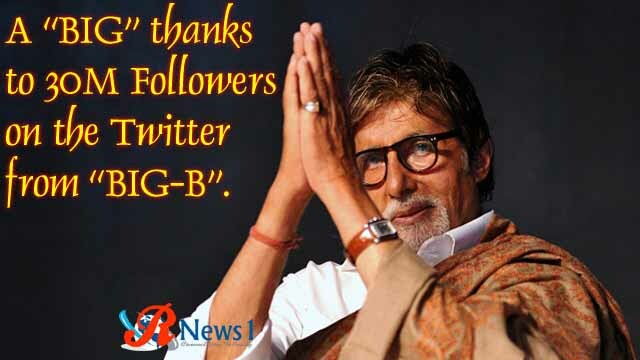 The Big B now hits another big achievement on micro-blogging site Twitter, as he has crossed the number of 30 million fan and followers there. The 74-year-old megastar, who has given many hits like 'Sholay', 'Deewar', 'Namak Haraam', 'Amar Akbar Anthony', 'Muqaddar Ka Sikandar', 'Don', 'Agneepath', 'Hum', 'Mohabbatein', 'Paa', 'Baghban', 'Bhoothnath', 'Black' and 'Piku', is ahead of stars Shah Rukh Khan (28.9 million), Salman Khan (26.5 million), Aamir Khan (22 million), Priyanka Chopra (19.7 million) and Deepika Padukone (20.7 million). The Big B is just right behind Prime Minister Narendra Modi, who has 35.1 million followers of Twitter. The "Don" star is active on the digital platform, and uses the medium to share updates about his personal and professional life. On Saturday night, Amitabh expressed his excitement. "Thirty million on Twitter. Some joys, some bitter. Looking for words to match the rhyme...hitter, sitter, fitter, litter," he said. The Bollywood's megastar is currently busy with his new two films, which is, 'Thugs Of Hindostan' and '102 Not Out'. Big B will seen on the silver screen with veteran actor Rishi Kapoor in Hindi Comedy-drama film '102 Not Out', which is directs by Umesh Shukla and is based on a running Gujrati Play written by Saumya Joshi by the same name.